Maribeth Nolan passed away on Friday evening at her home in Somerset surrounded by her loving family. She was 63 years old. Beth grew up in Clark, NJ where she stayed to raise her family with her husband Mark. She and Mark moved to Somerset 6 years ago. Beth enjoyed her annual passholder status at Walt Disney World, especially during Food and Wine Festival season, cheering for the Fighting Irish of Notre Dame, and attending concerts and shows. Above all, she loved spending time with her family. Beth had a loving and kind spirit, and she will be missed always. Beth was predeceased by her parents, Walter and Mary Sosnosky. 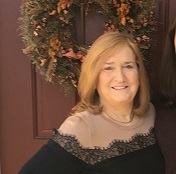 She is survived by her husband of 35 years, Mark Nolan of Somerset; her son, Kevin Nolan and his wife, Caroline of Metuchen; and her daughter, Megan Nolan of Bedminster. She is also survived by her sister, Sharon Nixon of Jackson. Visiting will take place at the Gleason Funeral Home, 1360 Hamilton Street in Somerset from 5-9 PM on Tuesday. Services will begin on Wednesday at 10 AM at the Gleason Funeral Home followed by a funeral mass at 10:30 at St. Matthias Church in Somerset. Committal services will follow at Resurrection Cemetery in Piscataway.